UKIP should become a "radical, populist party" standing up for free speech against the "politically-correct thought police", says its leader. Its "interim manifesto", unveiled on the eve of its conference, also urges a "clean exit" from the EU. Leader Gerard Batten said the policies unveiled aimed to help "the people who form the backbone of Britain". He is the fourth person to lead UKIP since Nigel Farage quit in the wake of the 2016 EU Referendum. 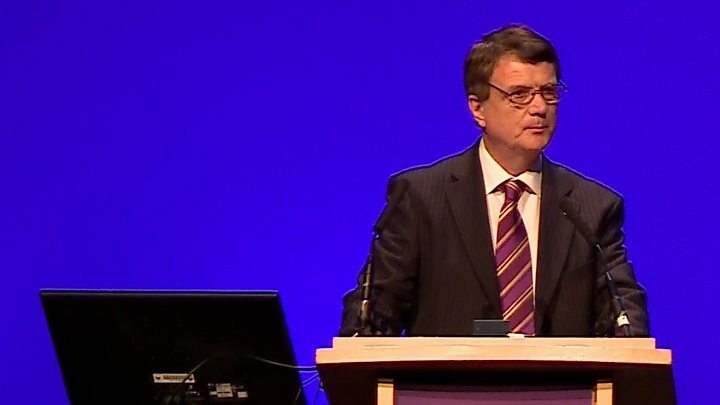 Under Mr Batten's leadership, membership has increased from a low of around 18,000 to approximately 24,000, according to UKIP, but critics have accused the party of becoming too right-wing. BBC political correspondent Alex Forsyth said UKIP has allowed controversial online video bloggers, to join the party and is considering whether to allow the former English Defence League leader Tommy Robinson to become a member. Sargon of Akkad and Count Dankula, self-styled You Tube activists and free speech campaigners, will be among those addressing Friday's conference in Birmingham. Aside from Mr Batten, other speakers will include Neil Hamilton, who was ousted earlier this year as leader of the UKIP group in the Welsh Assembly. The party's interim manifesto includes sections on free speech, political correctness and Islamic extremism, as well as the NHS, defence, education and policing among others. It urges a "complete and total withdrawal from the European Union", and says UKIP will keep fighting to make the UK an "independent, self-governing, sovereign state", regardless of any Brexit deal reached. In it, Mr Batten says UKIP will "promote and defend our national and individual freedoms" adding: "We are determined to protect our freedom of speech and the right to speak our minds without fear of the politically correct thought-police knocking on our doors." Mr Batten, who took over as leader in February but has said he intends to resign after a year, said: "These policies are aimed at helping the people who form the backbone of Britain: ordinary workers and taxpayers, the unemployed who would like to work, and small and medium-sized business owners." "Its purpose is to make UKIP a populist party in the real meaning of the word - one whose policies are popular with voters." The UKIP leader has hit back at claims of growing links between the party and far-right groups, telling Sky News he was "entitled to speak at rallies organised by people who believe in democracy". Mr Batten said Tommy Robinson would not be admitted to UKIP "in the near future" because it would require changes to the party's rules. But Mr Farage, who has returned to the domestic political fray with a campaign to "save Brexit", said UKIP risked "total and utter marginalisation" unless it changed direction. He told the Press Association he was "totally opposed" to allowing Mr Robinson into the party. "I wrote very explicitly into the rules of the party when I first became leader: we did not want anybody in the party that had taints with organisations we deemed to be on the far right of British politics," he said. "It really upsets me to see the fact this debate is even taking place." UKIP, which is marking its 25th anniversary this year, saw its popularity collapse in the 2017 election after securing only 594,068 votes - down from 3,881,099 in 2015. The party leadership has changed hands six times since the 2016 EU referendum, with Mr Farage returning temporarily when his successor Diane James quit after less than a month at the helm. Paul Nuttall succeeded her in November 2016 but quit following the 2017 general election - and Steve Crowther became acting leader. Henry Bolton was elected leader in September 2017 but was ousted following controversy over racist messages sent by his partner.